The Z-TECT™ technology platform can also become a specially designed and optimized targeted carrier system composed of a Targeting Unit and a Carrier Unit. The Z-TECT™ Targeting Unit (ZTU) relies either on antigen/antibody or ligand/receptor interactions for targeting. The Z-TECT™ Carrier Unit (ZCU) can be loaded either with drug molecules (such as doxorubicin) for cancer therapy or with radiolabels (such as Tc–99m, In–111 or Ga–68) for companion in vivo imaging diagnostics. This combination of therapeutic treatment and companion diagnostics is referred to as “theranostics”. Such applications provide the opportunity to monitor in parallel both drug treatment and disease progression, therefore rapidly evaluating patient response to treatment and permitting a more “personalized medicine” approach. Results shown below demonstrate the efficiency of in vivo imaging applications of Z-TECT™ with the detection of lesions less than 1 mm in size in both lung metastatic cancer (Figure 1) and prostate cancer xenografts (Figure 2). Figure 1. Serial anteroposterior gamma images (99m–Tc) of C57 B1/6 mice with metastatic lung melanoma B16F10 pre-targeted with Z–TECT™ Targeting Unit (top panels) or not pre-targeted (bottom panels). The next day, Z–TECT™ Imaging Unit was injected i.v. and images were obtained after 5 min, 45 min and 24 hrs. Arrows indicate lesions (Arrow #1 points to a lesion seen at 5 min which persisted). No lesions in the lungs were seen in the control animal (bottom panels). The ex vivo images with their corresponding photographs are shown on the right side (in cm). Figure 2. Co-registered transverse CT and SPECT image slices of SCID mice with human PC–3 prostate cancer xenografts imaged (In–111) at 3 hours post i.v. administration of Z–TECT™ Imaging Unit. 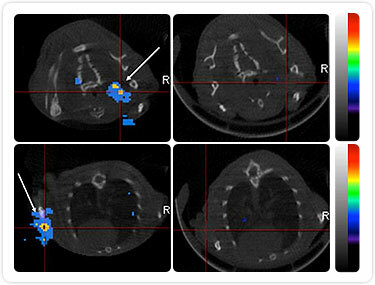 Tumors smaller than 1 mm in diameter in both right and left torso regions (left panels, arrows) are seen only in the mouse pre-targeted with Z–TECT™ Targeting Unit but not in the control (right panels). Doxorubicin-loaded Z-TECT™ is 15 times less cytotoxic than free doxorubicin at equivalent concentration towards H9C2 embryonic cardiocytes. Doxorubicin-loaded Z-TECT™ is 2 times more tumorotoxic than free doxorubicin at equivalent concentration towards PC3 human prostate cancer cells. Akrivis postulates that doxorubicin, while loaded on the Z-TECT™ Carrier Unit (ZCU), functions as an inactive prodrug which reduces off-target and non-specific toxicity as it travels systemically throughout the body. Combining the doxorubicin-loaded Z-TECT™ Carrier Unit (ZCU) to the Z-TECT™ Targeting Unit (ZTU) results in the efficient delivery of up to 80 doxorubicin molecules for each targeted binding event, therefore exposing cancer cells to much higher drug concentrations. Furthermore, Z-TECT™ Carrier Units have been specially designed to be rapidly cleared from circulation. As a result, a targeted drug delivery system based on Z-TECT™ would be far safer and more efficacious than current Antibody-Drug Conjugate (ADC) therapies. Finally, Z-TECT™ offers the additional ability to deliver high mixed payloads of radiolabels and drugs for “theranostics”, or high payload combinations of several distinct chemotherapeutic agents for “targeted combination therapy” at the molecular level. For more information about targeted delivery therapeutic applications based on Akrivis' Z-TECT™ technology platform, please contact us at info@akrivis.com. © 2009-2015 Akrivis Technologies, LLC. All Rights Reserved.